Increasing population density and mobility, and mechanization of workplaces, households, and leisure activities, have resulted in increased general noise exposure for most people. The consequences for many are concentration and sleep disturbances, noise-induced hearing loss (noise deafness), and damage to the nervous system in the form of stomach, heart, and circulatory problems. According to statistics from the European Agency for Safety and Health at Work, approximately 22.5 million people in Europe suffered from hearing impairment due to noise in 2001, and about 2 million were considered extremely deaf. The costs of hearing impairment have been estimated at EUR 78 billion per year. Noise deafness is regarded as the most important and most recognized occupational disease, predominantly affecting men who work in manufacturing, construction, and transportation. The general increase in exposure to noise has raised interest in the issue of noise protection and acoustic problems. 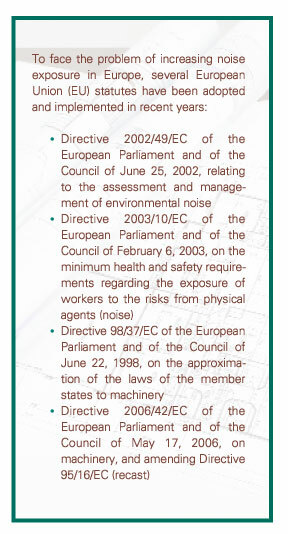 The Acoustic Commission of the European Federation of Associations of Insulation Companies (Fédération Européenne des Syndicats d’Entreprises d’Isolation—known as FESI) deals with these problems and assists its members with regard to acoustics and noise protection by providing information, including a series of six documents that address noise and noise protection. The documents can be used as a reference by planners, craftsmen, and contractors, but they are also applicable for training and studies. They provide detailed information about materials and systems and help users understand, evaluate, and solve acoustic problems. The idea behind the documents is to form a bridge between international directives and standards and practice-oriented application. Acoustics is the science of sound and its influence on human beings. Document A2 deals with physical and physiological basics such as origination, propagation, and sensation of noise. 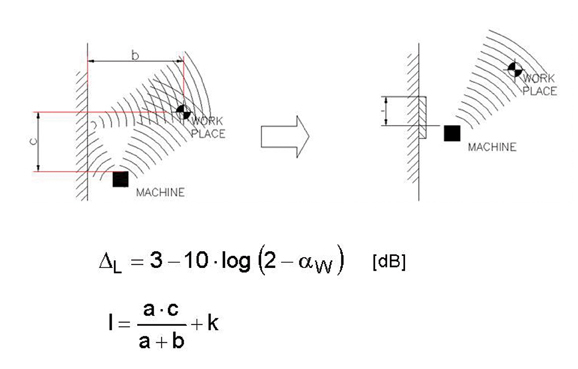 The simple calculation with sound levels, representation of noise weighting, and evaluation criteria forms the basis of acoustic planning and implementation of effective noise protection (see Figure 1). 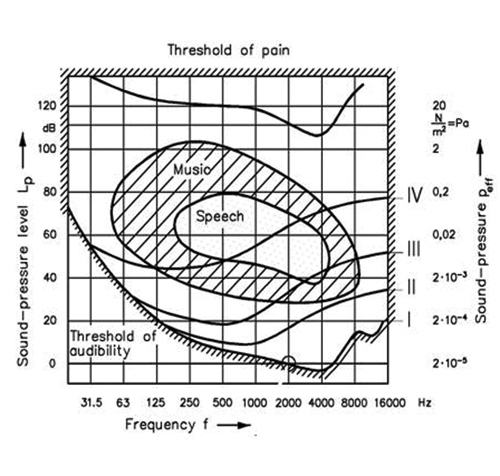 The range of audibility to the human ear and the sensation and effect of different noise situations are shown in Figure 2. Sound propagation in air, solids, and liquids—i.e., airborne, structure-borne, and water-borne sound—as well as description values for frequency, sound velocity, and wave length for sound events in these media are described in detail. Tables provide necessary material data and numerical values. The connections between these values also are explained, as is the level arithmetic—i.e., adding, subtracting, and the space and time averaging of sound levels. Materials, their characteristics, and their acoustic effects are the subjects of Document A3. Acoustic insulation, attenuation (absorption) properties of materials, systems, and special constructions are presented and discussed. The international character of the FESI Acoustic Commission guarantees that products, systems, and materials common in Europe are considered. Sound insulation and sound attenuation of airborne and structure-borne sound, their measurement in the laboratory, and the handling of the single values Rw and R’w are comprehensively explained using figures and examples. Simple calculations for single systems (plane walls or pipes) enable rough estimation of the acoustic insulation of corresponding monolithic systems like brickwork, concrete walls and ceilings, or sheet-metal constructions. Weaknesses of material and system are taken into consideration. Information about “double systems” (basic walls with insulation) and absorbent insulations (suspended ceilings) is important for contractors in the room and building acoustics industry. The effects of materials and dimensions, resonances, and coupling of single layers with each other are described. Calculations and theoretical considerations are completed and supported by numerous measured values taken from standards, laboratory tests, and literature, providing a summary. Document A4 describes sound transmission in buildings, noise protection between rooms and against outdoor noise, as well as problems of ventilation and other operating noises. Consulting engineers and contractors get useful hints for the correct execution of noise-protection measures to avoid possible sources of defect and to determine the effectiveness of noise-control measures. One precondition for the design and dimensioning of noise protection with regard to building acoustics is knowledge of sound transmission paths (airborne, structure-borne, and impact sound). Document A4 gives examples for sound transmission between rooms through the building structure, as well as along and through technical devices (air conditioning). Simple calculation formulae and given loss factors are provided to enable users to estimate insulation and sound-improvement indices. Diagrams provide information about the influence of leak points such as venting slots and keyholes on the acoustic insulation of walls, doors, and enclosures. Examples of systems and comprehensive tables with insulation coefficients of approved constructions also are included. Tables with detailed information and classifications of door and window constructions relating to sound insulation provide useful tips. Apart from protection against noise, acoustics also involves communication and information so that people in a room can hear and understand what is being said. Document A5 describes acoustic characteristics of rooms and how to influence these characteristics. The validity of these quantities, correlations, and proportions, as well as numerous requirements and recommendations, facilitate the weighting of speech intelligibility in different rooms. Subjective factors such as distinctness, spaciousness, harmony, and steadiness also are discussed. Especially helpful is the table “Key parameters suggested for different types of rooms,” which states by which quantities different types of rooms must be weighted. Subsequent chapters of the document provide details for the treatment and furnishing of rooms. Simple calculations of sound propagation in rooms of different dimensions (cubic, flat, or long) are provided, along with comments regarding natural frequencies, sound diffusion, and acoustic phenomena like echoes/flutter echoes. Noise protection measures and their materials and position in the room are described so the best possible effect will be achieved. As EU rules with regard to noise at the workplace and industrial plants’ effects on surrounding neighborhoods have become stricter, Document A6 is of particular importance. Contractors get significant information on the sound and vibration effects of machines and plant components, sound propagation in workshops or toward adjacent residents, and the execution of effective sound protection. Materials, systems, their dimensioning and effect, sources of defects, and problematic situations are also discussed. Document A6 first deals with sound propagation in free field; in rooms; and in ducts, pipes, and air-conditioning systems. It explains how the distance between sound source and receiver, distribution of the radiated sound energy, acoustic insulation and attenuation on the propagation path, and additional noise sources disturb the “receiver”—e.g., at the workplace or in the neighborhood of a plant. Simple calculations, tables with sound insulation and attenuation, and data of noise sources—e.g., in pipes and air-conditioning systems—enable estimation of disturbing noise and its reduction. A chapter on noise control discusses measures at the source or the point of origin, at the propagation path, and at the receiver corresponding to the model source, path, and receiver. Measures at the source and on the propagation path have first priority. The chapter describes the function and construction of silencers, sound hoods, and sound screens. Their effect can be estimated by a simple function, or it can be taken from corresponding tables. Table 9, “Orienting construction characteristics for the enclosure groups,” lists examples and minimum requirements to comply with desired insertion losses. Users get the desired information at a glance without time-consuming calculations. Absorbent wall or ceiling linings prevent or reduce sound reflections without influencing the direct sound. The effect of this noise protection measure depends not only on the material and its dimensions, but also on the position with regard to noise source and receiver. A figure is provided illustrating such a situation (see Figure 3). The effect of the measure can be estimated with the corresponding functions. Document A7, currently in progress, will be a reference for users of the other documents and includes all terms, rules, and body of directives. The chapter “Noise Control” references significant chapters of aforementioned acoustic documents, standards, and recommendations for further reading on dimension noise protection measures. The chapter “Measurements” describes how to prove the effectiveness of such measures, appropriate procedures and the use of the body of directives (regulations, standards, and recommendations) to determine sound emissions, as well as frequency-dependent weighting and evaluation. In short, document A7 will provide a framework for acoustical design and problem solving. Apart from completion of Document A7, the Acoustic Commission is dealing with the subject of acoustic comfort. The preparation of Document A5 with the acoustic evaluation of rooms according to their use (e.g., restaurants, classrooms, multi-purpose rooms) and terms like speech intelligibility and distinctness revealed that this subject has not been sufficiently considered in Europe. Thus, the Acoustic Commission first will verify the situation in Europe through use of a survey in the member countries, which will be supplemented by data of research and science, if necessary. Based on the results, recommendations will be given to standard organizations, working groups, and FESI members to enable them to design and implement noise-protection measures. Documents A2 through A6 in English and the bilingual edition (German/English) can be downloaded from the FESI website.